We’re almost nearing the end of our giveaway! Have you had a chance to win anything yet? If not, you better get those entries going! We’ve got another makeup item to gift to you, and my, oh my, is this one a stunner. Burgundies are always on trend during the holidays, so we’re going to give you the gift of colour: Chica-Y-Chico’s One Shot Eye Palette in Night Drink! These gorgeous eyeshadows are creamy, pigmented and a breeze to blend. In an array of plummy hues, these shadows come in a mix of glitters, shimmers, and mattes that are great for creating different looks to suit any occasion (our favorites are the warm wine shades right in the middle!). In chic and cute packaging, Chica-Y-Chico believes in transforming and giving every woman the confidence she needs to take on the world with high-quality products. No wonder they're one of Korea's hottest trending brands now! 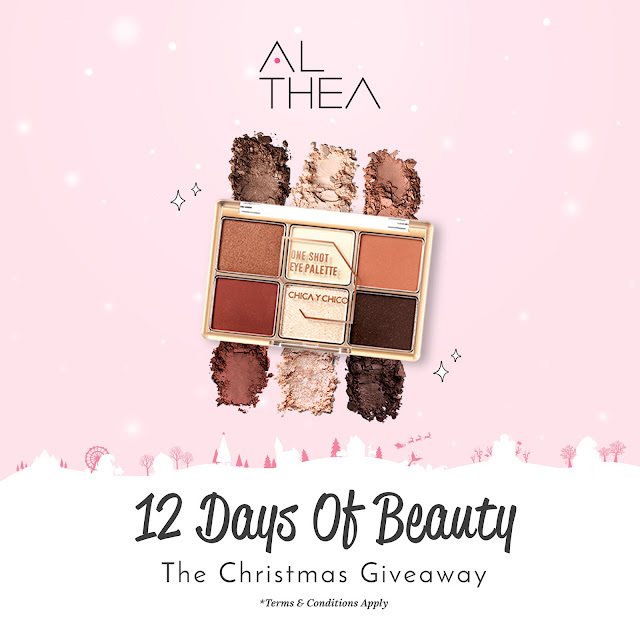 Tomorrow's going to be our last day of Althea's 12 Days Of Christmas, and it's going to be a big one! So don't forget to keep an eye out for our Instagram @altheakorea to get a sneak peak on the goodies we're giving away, and remember to follow the trail back here, so you stand a chance to win! WIN! 10 Lucky Altheans will stand a chance to win themselves 3 x Chica-Y-Chico’s One Shot Eye Palette in Night Drink worth USD36! All you have to do is fill in this form with the correct answer to enter. Super simple right? This day's contest ends at 11:59pm (KST) on the 18th of December 2017. Hello dear, may I know when will be all the winner announcement? In the blog post or Instagram? How you going to contact the winner, because we never provide email address. So excited! I just receive the products i ordered last week today from althea! hoping to get more gifts!